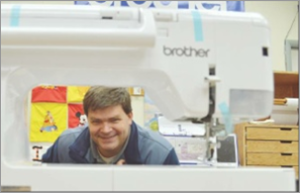 Business partners Alan Fairbanks and Ron Loynd started the 2015 New Year off in stitches by creating the All-Star Sewing and Embroidery store. The men purchased the former Sperry Sewing Center at 475 Yellowstone in January of 2015. Loynd learned to sew when he was just 6 years old. It’s a hobby/skill he honed throughout his life, thus enabling him to now turn it into a career at the shop. Fairbanks doesn’t sew, but what he lacks in stitching, he makes up for in maintaining sewing machines. “Ron does the sewing portion, and I do the repair,” Fairbanks said. The company sells everything from beginner sewing machines to the most advanced machines in the industry. Some are sewing/embroidery combo machines, others are either sewing or embroidery only.